The book integrates the scientific perspective of traditional medical care and healthy lifestyle habits of an Oncologist/Associate Professor of Medicine with the wisdom-based techniques and teachings of a Psychotherapist/Healer. 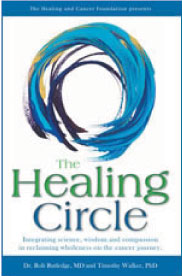 Following the agenda of a “Skills for Healing Cancer Weekend Retreat” this book also offers inspiring true stories of people attending the program. Its practical and integrated approach maximizes the chance of recovery from cancer – and allows the cancer journey to be viewed as a journey of the spirit. The Healing Skills DVD contains the Healing Yoga, Qigong and Guided Meditations used during the Skills For Healing weekend retreats. These gentle but invigorating exercises can help restore body, mind and spirit. The Healing Program arose out of ten years collaboration between Dr. Rob Rutledge, an oncologist, and Dr Tim Walker, a psychotherapist. With it, they have helped hundreds of people. The success of their approach comes from people seeing and accepting the whole human experience, including 'negative' emotions such as fear. People who go through the Healing Program learn they can face - and potentially embrace and transform - whatever comes with diagnosis and treatment. You can have incurable cancer and yet feel your life has been healed. In its essence, the Healing Program teaches you how to empower yourself by using information, skills and a loving perspective on ways to take care of your body and settle your mind. It is ideal for individual practice or as the shared experience with support group.